HLS, SMOOTH and MPEG-DASH are the main streaming format. They are currently used for delivering both Live and VOD video streaming on desktops, tablets and phones. And you are certainly using one of them on your own website. Your website delivers some videos and you expect that your customers can watch them without any lags or buffering delay; yet, you don’t know if your server infrastructure is able to handle the load incurred by the users traffic. What you know is that being one second faster increase significantly the conversion rate. However, video streaming load testing is complex. You have to script different formats and simulate a player, which requires time, skills and money. Thinking about it, all you want is an easy way to test video streaming. UbikLoadPack VideoStreaming Plugin already allows you to test HLS, MPEG-DASH or SMOOTH streaming format in VOD. It also handles Main Live MPEG-DASH manifest and Live SMOOTH manifest. We also offer advanced settings for Adaptive Bitrate Streaming. You can now choose a specific bit rate for each segment of the video in a very precise and simple way. We also add preemptive basic authentication with the Authorization Manager. There is no magic in this. We simply do our best for you. You just give us the video URL. You optionally add a time to play, a bandwidth, a connect timeout and/or a read timeout. The plugin will detect the format. It will also detect if it is VOD or Live streaming. Any case, the plugin will load the video and simulate the reading in the most realistic way. Is it a VOD? It will parse the manifest and find every chunks in the playlist. Then, it will download and read them in real-time. Is it a Live? It will find every available chunk. Then, it will download and read them in real-time, reloading the following ones in the appropriate time. 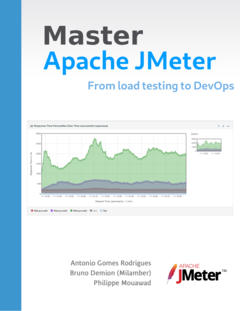 You may first start JMeter with the plugin. Documentation is provided with the plugin. Then, you just have to create a test plan and add an ULP Video Streaming Sampler. If you use the Adaptive Bitrate option in the network options, a new element will be added under the sampler. It allows you to configure a precise bit rate for a precise number of chunks to play. You may click on the “Add” button. Then, new text fields will appear. On the first one, you may inform the bit rate you want. A list of the available bit rates can help you on the right side of the frame. On the second one, you may inform how many chunks will use this parameter. During the test, the different bit rate parameters will be applied to the number of chunks informed from the top to the bottom of the list. Advanced settings also means advanced metrics. On the bottom of the main frame, a list of sample_variable are proposed to add to the user.properties file before running the test. Those new variable will returns the percentage of chunks read in the given bit rate. That’s it. You can run your test plan and analyze the results.